The Truth and Reconciliation Commission of Canada on Indian Residential Schools closes its multi-year mandate with events here in Ottawa over the next few days. Here are listings of official TRC events open to the public as well as others being held independently that are related in theme. These listings may change and are not guaranteed to be accurate. The official TRC website for the event program can be found at this link or the full PDF version here and includes more details/description on the official TRC events. Unless noted, all events listed below are free. ** The listings here do not imply my association/involvement with or endorsement of any of these events. 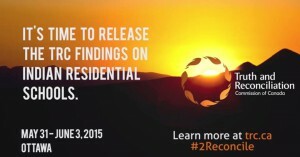 Note also that the TRC is providing live webcasting, at this link. Please scroll down for the listings. 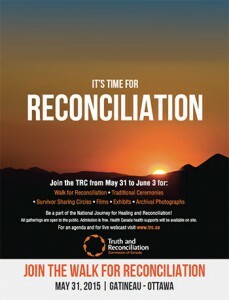 First – a video clip of TRC Chair Murray Sinclair speaking about how the residentials schools constituted an act of genocide against Indigenous peoples in Canada (you can see the full video interview with Sinclair, along with an interview with Barney Williams Jr of the TRC Survivor Committee, and an article from the Montreal TRC event, at this link). Also of note: these events are all taking place on unceded and unsurrendered Algonquin territory. There is currently a lands claim process underway for much of Eastern Ontario that would make the land ceded. You can listen to this interview with policy advisor Russell Diabo on the injustice involved. The Witness Blanket, a large art installation designed by Master Carver Carey Newman. The Witness Blanket incorporates almost 900 fragments of personal and national history to tell the story of the First Nations, Métis and Inuit children and their families who were impacted by the Indian Residential Schools from the 1870s to the 1990s. It will be on display at Ottawa City Hall, 110 Laurier Ave West, until July 9 as part of a planned seven-year cross-Canada tour. Kisemanito Pakitinasuwin, The Creator’s Sacrifice, a series of stunning paintings by Cree artist Ovide Bighetty, will be displayed until June 3 at St. Joseph’s Parish, 151 Laurier Ave East. Visit during opening hours (generally 9am – 7pm) to view the art work and reflect on the journey of reconciliation. 12:15-1:15pm – What do we do about the legacy of Indian residential schools? Opening remarks from Ottawa area youth: Raiyah Patel and Theland Kicknosway. Panelists are Dr. Cindy Blackstock of the First Nations Child and Family Caring Society, Imam Dr. Zijad Delic, and Dr. Tracy Coates from the Institute of Canadian and Aboriginal Studies. Moderated by CBC journalist Waubgeshig Rice. Journey with a group of Indigenous youth as they discover their connection to Indian Residential School legacy. Pizza will be served. Hosted by Debweyendang Teg Youth Drop In. ​​Hear Ana Guadalupe Matzir Miculax and Crisanta Perez’ views on the impacts of Canadian mining companies in Guatemala. Great job could you please also share all to be visible to History and voices of the people heard. Wed. June 3 at 10 am at same time T+R Commissioners have private closing ceremony at Rideau Hall to honor ending one era and entering a new!